Birmingham City fans agree that the club is in bad way but don’t agree on what needs to change. Some very simplistic solutions are bandied around on internet forums — sack Clark, boycott St Andrews — but even their proponents don’t usually claim that such actions will bring an end to all our troubles. Most of us would probably agree that things won’t improve until we get new owners and that might not happen for some time. What needs to change is the title of Daniel’s last chapter. He believes that the Premier League and Football League should have stricter rules about who can own a football club and enforce those rules. I agree with Daniel on this, the ‘fit and proper’ test for owners is not fit for purpose. Based on their previous history, I can’t see the leagues taking action without pressure from fans and from government. So, although I think it would be better for the leagues and the Football Association to safeguard the future of football in this country, I’d be in favour of the government pushing them in the right direction if they won’t act of their own accord. The Labour Party has announced that there will be a legislative shake-up in English and Welsh football if they are in power after the next election. Their plan would give supporters seats on the board and “influence over ticket prices, shirt sponsorship, ground naming rights and plans to change the colour of the strip or the club’s name.” Supporters would also have the right to buy shares if the ownership of their club changes. In the meantime, I’ll continue to support my team. And I’ll finish reading the book. 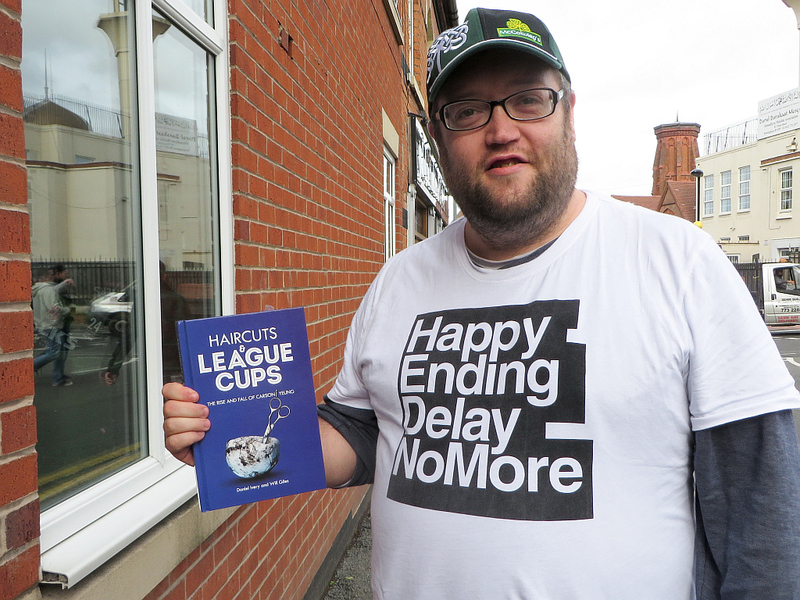 Winston Churchill said, “Those who fail to learn from history are doomed to repeat it.” I think Haircuts and League Cups is going to help me understand the recent history of my club. What needs to change ? I’m beginning to think that if we’d been relegated last season much of this would have occurred by now. Clark has a group of players who should comfortably finish mid table but lacks the skill and ability to bring this about. For what ever reason several teams have changed manager and improved. Watford have had three or four managers this season and with that turmoil they still top the table. Charlton, Cardiff, Leeds, Huddersfield & Fulham have either improved or stabilised under their new manager, Brighton are the only ones imo to have declined. Many say that no one could do a better job with the resources at Blues, but that is an unproven statement as there are no accounts for the current season, only conjecture. Rotherham with gates of only 9,600 and players on free transfers just like Blues are so far consistently above us in the league, the same goes for Millwall and Hudderfield. I’ve excluded Brentford & Bournemouth as they have rich owners who dip in their own pockets when needed. There are other clubs like Blues without rich owners and without big transfer fees but they get higher gates because their home form attracts more fans, like Ipswich, Sheff Weds and Derby, this extra income allows them to pay higher wages which attracts better players on free transfers. Clark has to go as something has to be tried to turn this home form round, what else can the club change. A fresh pair of eyes is needed, he himself changed his backroom staff and the players and nothing has changed. LC needs to either bring in another more experienced organisational face to support him or he needs to leave. There are small thngs missing, i don’t think we are a million miles away but he either isn’t listening to his backroom staff, makes the wrong decisions at the wrong times or is missing some expertise in some quarter. Do we have a sports pshycologist at the club? An old hand helping out and supporting Clark for a fixed contract term for a few months like Trevor Francis, Kevan Broadhurst, Alan Curbishley, Micheal Johnson, Barry Ferguson or non Blues Steve Clarke, Graham Taylor, Sean O’Driscoll or Brian McDermott (just joined Arsenal). Something has to be tried or apathy will continue to grow, we heard from the passive fans last year and the home form never improved, so a year on we hear the same comments but in that year we have won once at home. Unless something changes in term of coaching staff we are going down. The original quote regarding learning from history is actually attributed to George Santayama who in his book, The Life of Reason (1905) stated; “Those who cannot remember the past are condemned to repeat it.” Churchill didn’t actually say the same thing in so many words. The National Churchill Museum blog states that “Churchill worried not so much that those who forget the past are condemned to relive it, but that the loss of the past would mean “the most thoughtless of ages. ” This was much later in 1948. Thanks Bazza. I always appreciate corrections.